When publishing a post to WordPress, it is common to include tags (keywords) so that users can use these as a search tool for locating other posts with similar content. (For more information, see the WordPress documentation). The Publish Form for publishing a post to WordPress contains a field from which tags can be chosen that are defined on the WordPress Web site. To make these tags available, they need to be imported into Enterprise Server. When should tags be imported? Step 1. Access your WordPress Dashboard and click Tags. Step 2. Add, edit or remove tags as needed. Step 1. Access the WordPress Maintenance page. The WordPress Maintenance page appears. Troubleshooting: why does WordPress not appear on the Integrations page? The WordPress icon is only available when the Server plug-in "WordPress Publishing Connector" is enabled. 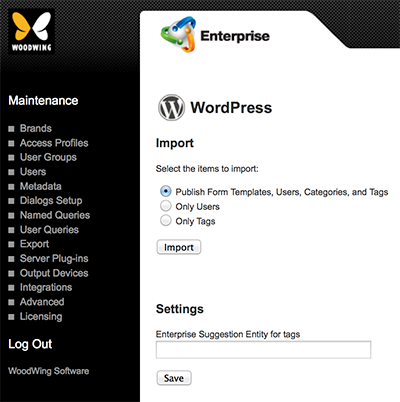 See Integrating WordPress in Enterprise Server 10. Step 2. In the Import section, choose Only Tags. The tags are imported and the result of the import action is displayed.